This is my first Crochet Along Project with Dynamic Crochet Group. The 1st and 2nd circle I did quite fast, but then I got slower in the 3rd circle. I finished it while I’m on my Christmas vacation. Actually, I have a little bit problem to start the 2nd and 3rd circle. I improvised to start the 2nd circle and have some clue from others member and try it on the 3rd circle. I still confused how to join the last circle and again I just improvised. I feel my work is still untidy and the finished project look curly here and there. Maybe because of the yarn or maybe because I didn’t count the chain as instructed. Anyway I’m glad I finished it, at least now I have more experience in crochet. My husband said, it seems I crochet faster than knitting, maybe because I still have not finish knitting his scarf which I started before I made this doily. Somehow doing something along with the group make me feels want to finish the project as soon as possible. 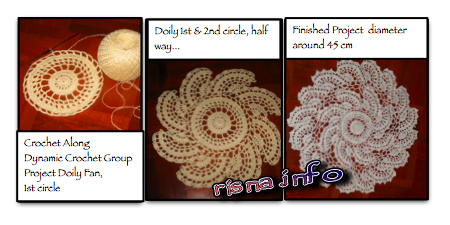 Thank you for all dynamic crochet group members :).